Where has half my summer gone??? I go back to work in 24 short days, so I need to make the most of them. 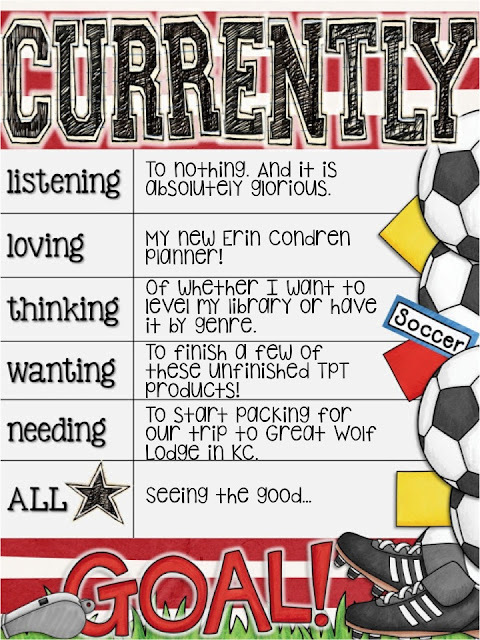 But first, how about a little Currently with Farley over at Oh Boy Fourth Grade??? Click on her button below to see what it's all about and join the link up! Listening: Everyone else is the house is asleep. I am enjoying the quiet. It doesn't happen often. Loving: I am in love with my new Erin Condren Life Planner. I'm not all obsessed with decorating it and turning it into the amazing piece of artwork, but I did make some stickers for it on my Silhouette. They turned out pretty cute, if I do say so myself! Thinking: Last year my classroom library was genre based as opposed to leveled. The year before it was leveled. I prefer genre, but I'm struggling with finding a good fit for my new school. Maybe I could find the best of both worlds??? Wanting: I have a few new products for TpT in the works, but I've got to dig in and finish them. It's so easy to get sidetracked by this cutie-patootie 2-year old shadow I have around all day. All Star: Sometimes it's so easy to get bogged down in life. One thing I think I'm good at it seeing the good in situations. I had a principal who used to say, "It is what it is." Actually, I think it's more, "It is what I make of it." I can choose to be miserable, or I can choose to make the best of a situation. And I choose to find the good! I'd be interested in knowing the benefits of sorting your library by genre versus level! I just got my Erin Condren life planner and I LOVE IT TOO!! I would love to see how other teachers use their EC planners for teaching. Right now mine is split between home and work, but I'm thinking that might change once school starts. We'll see! I'm almost embarrassed to post pics of my planner. I was so overwhelmed by it that I just got it out of the box this weekend. But, if it works for me, then I'm happy! When I was in second grade, I used to level my library by both genre and level. I couldn't find the levels for all my books, so those would go in the genre bins! Enjoy your trip! I think I am going to try to do both, so we'll see how it turns out!